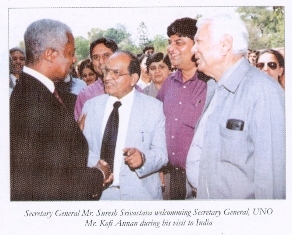 Indian Federation of United Nations Associations ( IFUNA ) was established more than four decades ago to promote the objectives of the United Nations and its Specialized Agencies. It is a Non-governmental, Voluntary, Nonprofit Organization working for International Peace and Understanding. IFUNA strives to focus its programs and activities around the vital concerns of the United Nations, like, Peace, International Understanding, Environment and Human Rights. In conducting all these activities and programs, effort is made to involve the leadership from all sections of society so as to make them broad based and effective. IFUNA maintains close liaisons with Government Organizations, Press and Diplomatic Missions interested in United Nations activities. IFUNA has already created a niche for itself in the academic and social circles of the country through its varied and numerous activities like Lectures, Seminars, Symposiums, and Observance of U.N. Days, Debates, Competitions and Exhibitions on U.N Subjects. Indian Federation of United Nations Associations ( IFUNA ) is affiliated with the World Federation of United Nations Associations (WFUNA). 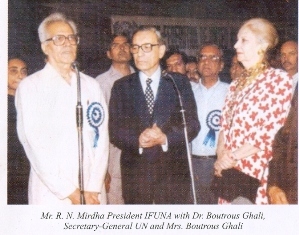 IFUNA is the only body to represent India in the U.N. Forums. 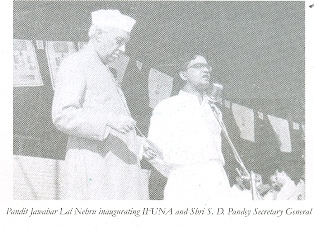 IFUNA was founded by Late Sh. Acharya Narendra Dev who was a political thinker and social reformer. Galaxy of Luminaries had adorned the office of President of IFUNA like Late Smt. Vijaya Laxmi Pandit Former President of General Assembly U.N.O., Late Mrs. Savitri Nigam, Member of Parliament, Late Mrs. Rajan Nehru, Member of Parliament Late Sh. Ram Krishan Hegde, Member of Parliament and Late Shri Ram Niwas Mirdha, Member of Parliament. IFUNA has a network of affiliated State United Nations Associations in various states of the country such as Andhra Pradesh, Assam, Bihar, Chandigarh, Chhattisgarh, Gujarat. Haryana, Himachal Pradesh, Kerala, Karnataka, Madhya Pradesh, Maharashtra, Manipur, Meghalaya, Orissa, Rajasthan, Tamil Nadu, Uttar Pradesh and West Bengal.